Oh, if I only had a brain, I would definitely buy a well known, lovable character fancy dress costume for Book Day! 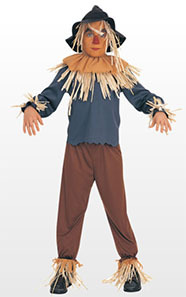 In fact, this Scarecrow fancy dress costume from the Wizard of Oz, could be ideal. Available in three sizes - small (age 3-4 years), medium (age 5-7 years) and large (8 - 10), the costume comprises of a hat, headpiece, shirt and trousers. The outfit is £27.99 online with the straw kit to complete the look available separately for £7.49.